Agents of S.H.I.E.L.D. was one of the shows that I most anticipated this fall. I know that a lot of people had their problems with the first season, but if you stuck with it until the end, I am sure you are now as excited as I am. There were quite a lot of shockers, turn of events and cliffhangers at the end of Season 1 and I can’t tell you how happy I am about the show finally continuing. This review contains Spoilers for the first episode of Season 2 called “Shadows“! I think I’ve read somewhere that Agent Carter would make an appearance, but I couldn’t really imagine how that was going to work out. I think they incorporated her cameo really well and we now finally know why all the 084‘s are called that way. Ward … I was so shocked last season! I never ever in a million years expected him to be part of Hydra and I still don’t know if we can ever trust him again. Although I am not even part of the team, I just felt so betrayed and hurt by his actions. They were like his family! However, seeing him on lock-down and the (emotional) pain he was in, I couldn’t help but feel a little bit sorry for him. And I would really like to know what he knows about Sky’s father! Speaking of Sky! She really became all tough and I like that. So, Coulson is now the Director of (what’s left of) SHIELD. His priorities seem to have changed a lot, or is that just my feeling? I just can’t imagine him putting his team at a risk like the one he did during this episode before he became director. There were a lot of new characters introduced, of whom only very few seemed to have survived the first episode. I find Hunter (Nick Blood) to be quite intriguing and I am happy to hear that he will be part of the principle cast this season. It’s no secret that I adore Iain De Caestecker, but he just broke my heart during “Shadows”. I was hoping so bad that Fitz would be alright after Season 1, but he’s not and I have to admit that I cried. His acting was just beyond amazing! FitzSimmons were always my favourite part of the show and I cannot believe that Simmons left him! I am so angry at her! She was the one person he was supposed to always be able to rely on … How could she do that to him? This season is going to be brilliant from the looks of its first episode. Not many shows manage to jump right back in and capture me like that. What’s your opinion of so far? Funnily, I had the same thing happening to me that happened to me with the premiere last year: I needed to rewatch it. Last year, I didn’t really get the premiere, felt disappointed and moved on. Only towards the end of the season I attempted watching it again, and then found myself watching most of the season in one long marathon. And even picked up the behinds-the-scenes book (I’m a horrible nerd). The opening episode had the same effect on me – I felt lost quite quickly and it only made sense to me once I rewatched it. I enjoyed the next episode quite a bit – there’s always something about those blasts from the past! – and I am curious about the new characters we are getting. Really looking forward to see how this season will shape up to be. I actually loved it right away and then I got a little tired of it in the middle. However, the show really shocked me towards its season finale and I enjoyed watching it again. I hope it won’t be like that this season! The new characters really seem interesting and I can’t yet figure out what the deal is with Hunter, so I’m enjoying that as well. Fitz is really killing me though. I am a huge Iain De Caestecker fan and he’s just brilliant this season! I’m a little scared about what happened with Simmons though. This was quite a good season premiere! I admit i was completely surprised when they made the big reveal about Fitz’s traumatic brain injury. And Ward works much better for me as the manipulative psychopath taunting Skye from the basement cell. I’m sure Simmons will be brought back into the main cast soon enough, fortunately. Also good to see Reed Diamond showing up as a potential recurring bad guy. In all, a very good start for a show that took a little too long finding its footing last year! Have you just watched the first episode of the season or more already? Because I agree with almost everything you say, but I now already know that Simmons shows up again, Reed Diamond as well and Fitz continues to break my heart every episode. I loved that they managed to surprise me so much with his condition and the fact that he only imagines Simmons by his side. What do you think of the new characters? LOL, I’m 2 weeks behind (you should see the state of my DVR) so haven’t got to Episodes 2 & 3 yet (and with the new Dr Who tomorrow, won’t be getting to them for a while yet). To be honest, the new characters haven’t made an impression yet (apart from returning characters who I remember from Season 1). 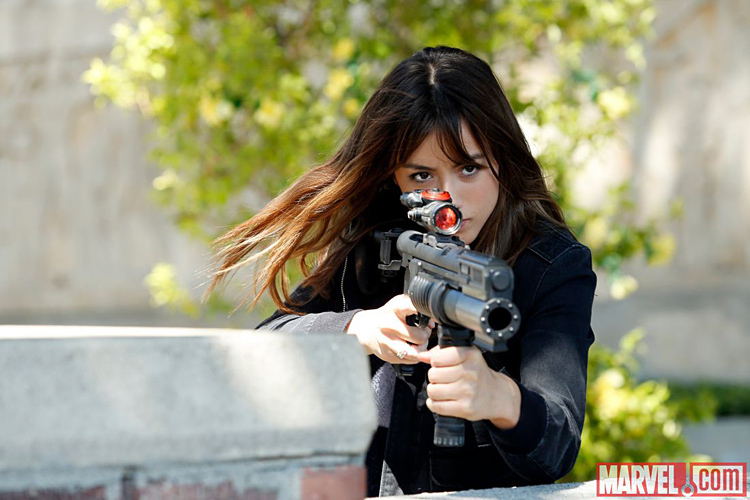 Will you be reviewing all the new Agents of SHIELD episodes as they air? I get that! There is so much to watch right now and so little time. I don’t think I’ll be reviewing all of the SHIELD episodes, because there are just so many of them. BUT I might do the mid-season and the season finale. I’m not even sure how many people would be interested in a weekly review, because I don’t think many people read the one I wrote for the first episode. No worries, but I do promise to read/comment on any SHIELD write-up that you do post!